Another Sunday, Another Giveaway! 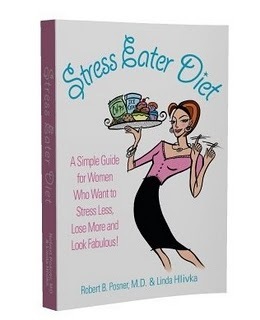 "Stress Eater Diet" & "Wake Up To Your Weight Loss"
Many of you may remember when I reviewed and gave away a copy of “Stress Eater Diet” by Robert Posner and Linda Hlivka in February 2009 and “Wake Up To Your Weight Loss” by Alyson Mead in October 2008. Now it’s time for me to part with my own copies of these great books because they aren’t doing anyone else any good just sitting on my bookshelf, and they are way too full of good stuff to keep hidden away. In this giveaway, you get to choose – in your comments and emails – which book you’d like to win (yes, you can choose both). You don’t have to give a reason, just the title will get your name in the hat. Before you decide, here are some highlights from my review of each book. Another big reason I can recommend this diet is its use of journaling, both food and emotions. Long-time readers, you know I’m all about journaling, even before you start to lose weight. Figuring out WHY we overeat, WHY we treat ourselves the way we do, and WHAT we eat can help us develop personal strategies for overcoming old patterns. You can check out the Stress Eater Diet blog by clicking here. 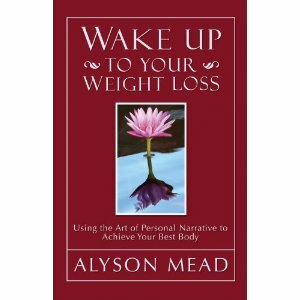 It is through my (still small) understanding of Buddhist teachings that I recommend “Wake Up To Your Weight Loss”. Mead’s approach to weight loss combines writing and meditation to help readers cultivate loving kindness toward themselves and their bodies. I like how she sums up what meditation is: “The mistaken belief about meditation is that it is somehow magical, bestowing peace and light on whomever it touches. But meditation is simply a tool, to help you focus in on and, more importantly, learn to cope with the stuff your mind may fling at you.” And if your mind is anything like mine, what it flings is often a lot of s*it. So…you know the drill. If you want to win one or both of these books, leave a comment or send an email to lynnbering@verizon.net and I’ll throw your name into the appropriate hat. I will draw a winner on Wednesday, May 12! Congratulations to Gretchen who won last week’s Dummies giveaway! I’ve still got a lot of books and DVDs to go in the upcoming weeks! This entry was posted in Uncategorized on May 9, 2010 by Lynn Haraldson. Hi Lynn, please include my name for the “Stress Eater Diet” giveaway. Also, Happy Mother's Day!!! Both sound like good reads. Throw my name in the hat for both of them. Hope you are having a great mother's day! Happy Mother's Day! Please throw my name in the hat for the book giveaway. Take care! Would love to read the “Stress Eaters Diet”. Thanks. I would like to win “Wake Up To Your Weight Loss”, thank you for the consideration! I'd like to win either one – they both seem useful! I just want to say that while I rarely comment, I've been reading your blog (and Refuse to Regain) for a while now. I have just started my weight loss journey, and have about 65 pounds to lose. Thanks for lots of inspiration and great tips – I always look forward to reading! I love reading all types of diet/nutrition/weight loss books. If I had to choose one, I would choose the Stress Eaters Diet, but I would love both. You look amazing. It is inspirational! Please throw my name in the hat for the drawing for the Stress Eater Diet. Thanks! Your blog is inspiring and I'm a bookaholic so I would love either one of them! Thanks for letting us share your life.